Bill’s Story is a short animation that has just been launched to help explain the way health and care will be delivered across Staffordshire. Bill is supported by a new team called an Integrated Care Team (ICT) which is made up of professionals from health, social care and the voluntary sector who support him in a coordinated way. 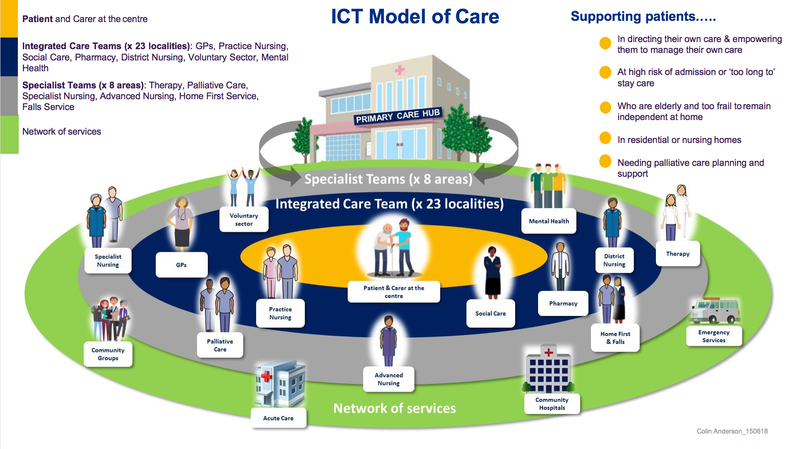 The vision of Integrated Care Teams (ICTs) has been developed through Staffordshire’s Sustainability and Transformation Partnership (STP), Together We’re Better. Make it easier for health and social care staff to work across different organisations and with the voluntary sector. Be reflective of the needs of their population. As the image below helps to explain, the aim is to put the patient and their carer at the centre of their care. The Integrated Care Team (ICT) should work with people locally to deliver joined up care as effectively as possible. There will be 23 ICTs across Staffordshire, 10 of which will be in the North including Stoke on Trent, Newcastle-under-Lyme and Staffordshire Moorlands. ICTs are able to pull in support, when needed, from the Specialist Teams for things like palliative and End of Life care, physiotherapy and specialist nursing. The really positive thing for us is that the voluntary sector is recognised as a key part of the Integrated Care Team alongside GPs, Social Care, District and Practice Nursing, Mental Health Support and Pharmacy. Quite how this will work in practice is still being developed and there are early implementer sites across the county that are working various ideas up. One of these sites is Longton/Meir where The VCS Hub forms part of the team, enabling links into wider voluntary sector support. Early data has shown that 30% of people supported by this ICT benefited from voluntary sector support. The ICTs are evolving in different ways with different specialisms. For example in Lichfield the focus is around Frailty. Each ICT will focus on different specialisms based on the needs on the people in that area. You can read a bit more about ICTs and the STP’s Leadership Team’s visit to the early implementer sites here. Take a few moments to watch Bill’s Story and share this with your colleagues and networks.